Proteolytic degradation by secreted proteases into the culture medium is one of the significant problems to be solved in heterologous protein production by filamentous fungi including Aspergillus oryzae. 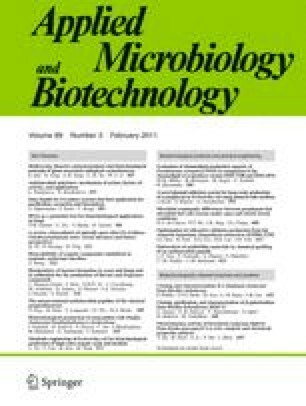 Double (tppA, and pepE) and quintuple (tppA, pepE, nptB, dppIV, and dppV) disruption of protease genes enhanced human lysozyme (HLY) and bovine chymosin (CHY) production by A. oryzae. In this study, we used a quintuple protease gene disruptant and performed successive rounds of disruption for five additional protease genes (alpA, pepA, AopepAa, AopepAd, and cpI), which were previously investigated by DNA microarray analyses for their expression. Gene disruption was performed by pyrG marker recycling with a highly efficient gene-targeting background (∆ligD) as previously reported. As a result, the maximum yields of recombinant CHY and HLY produced by a decuple protease gene disruptant were approximately 30% and 35%, respectively, higher than those produced by a quintuple protease gene disruptant. Thus, we successfully constructed a decuple protease gene disruptant possessing highly improved capability of heterologous protein production. This is the first report on decuple protease gene disruption that improved the levels of heterologous protein production by the filamentous fungus A. oryzae. The online version of this article (doi: 10.1007/s00253-010-2937-0) contains supplementary material, which is available to authorized users. We thank Toshiko Tanaka for experimental help. This study was supported by a Grant-in-Aid for Scientific Research (S) from the Ministry of Education, Culture, Sports, Science, and Technology of Japan and by the Program for the Promotion of Basic Research Activities for Innovative Biosciences (PROBRAIN) of Japan.